Your tax-deductible contribution will help the Landmarks Orchestra bring the transformative power of music to the widest possible audience! Visit the Donor Benefits page to learn about the ways we say thank you for your generous support. If you have any questions or concerns, please feel free to e-mail us at [email protected] or call our office at 617-987-2000. 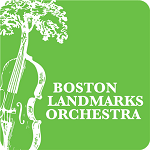 The Boston Landmarks Orchestra is a 501(c)(3)organization, donations to which are tax deductible.